After being mobilised with the army in 1912, he went to the frontline in summer 1914 with the 11th Dragoon Regiment. His unit distinguished itself at the Battle of the Marne and during the “Race to the Sea”, where the dragoons charged at the enemy, lance in hand. In January 1917, he joined the 20th Chasseurs à Pied Battalion (light infantry). With this elite corps, he fought at the Chemin des Dames in Aisne, then in Champagne during the final German attempt to break through the French front. 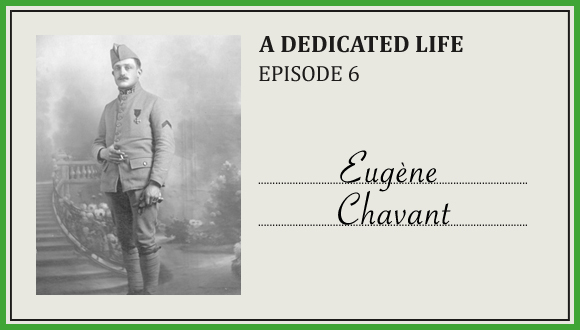 A “Living example of duty”, Sergeant Chavant refused to be evacuated when he was gassed near Soissons in 1918. He received the Médaille Militaire and 3 citations with his Croix de Guerre decoration, and left the army in 1919. Having become a café owner and local official, he joined the Resistance in February 1941 in the Grenoble region. In 1943, he became the civilian leader of the Vercors maquis, where he took care of logistics and supplies for fighters who were short of all kinds of things. In July 1944, he managed to evacuate many women and children while the Germans were preparing to attack the maquis.